Autumn in southern Ontario is a wonderful time to enjoy an outdoor festival. Ball's Falls Conservation Area on the Niagara Escarpment near Vineland is an ideal location for the four day Thanksgiving Festival hosted by the Niagara Peninsula Conservation Authority. Restored buildings, a magnificent park and beautiful natural waterfall add to the ambience of an event that is more than twenty-five years old. Proceeds from admissions contribute to the upkeep and programming at thirty-four conservation areas. Organizers of the Ball's Falls Thanksgiving Festival Craft Show and Sale assure there is a wide variety of activities for all ages to enjoy. More than 140 artisans display quality arts and crafts in tents and under mature maples stunningly beautiful in their autumnal finery. 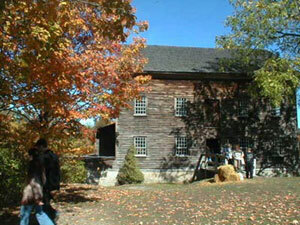 Living history demonstrations are presented in and around on-site heritage buildings. One of the most interesting is Aboriginal Traditions. Interpreters like John Sharp of Grimsby bring this important aspect of North America's history to life. A tour of the grist mill, Ball Homestead, blacksmith shop, Fairchild-Secord cabin and St. George's Church give an exciting visual presence to local history. Wandering minstrels, puppeteers, magicians, musicians and other mobile acts keep visitors entertained as does continuous music on the Showmobile Stage. Children enjoy their own hands-on activities in the Kidz Tent. A Live Raptor display garners their attention out-of-doors as do pony rides and machinery displays. Food is available on-site but line-ups tend to be long at lunch time. Beat the rush. Pack a picnic. Wash it down with bottled water sold by the Conservation Foundation. While on the subject of food, snack your way through the Country Store Tent where jams, jellies, sauces and chocolates tempt your palate. Daily arts and crafts demonstrations that include wild fowl carving, decoupage, Victorian jewellery, clay work, primitive and rustic furniture, are held in the Big Barn. Visitors are encouraged to ask questions. Take time to enjoy the natural beauty of the Conservation Area. 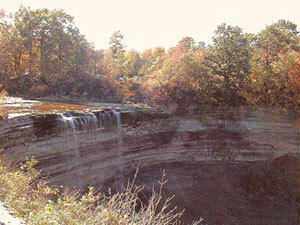 Ball's Falls with its spectacular drop over the escarpment can be seen from an observation deck behind the Grist Mill. If you are interested in walking part of the Bruce Trail that runs through the park, hikes are offered by the Niagara Bruce Trail Club, beginning at the Information Tent at various times during the festival. For those who love to sing, a "Giving Thanks Sing-Along" is held in St. George's Church on the final day of the festival, Thanksgiving Monday. This historic building is also a fitting location for the harpists who entertain during the weekend. As a courtesy to visitors a First Aid and baby comfort station are located in the park, as is an information tent. Getting to Ball's Falls Festival can be an experience in itself. 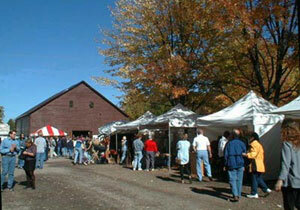 For several miles through Vineland, arts and crafts booths are lined up on both sides of the road. The entire area in effect becomes one gigantic marketplace, a mecca for crafts-oriented person. Enjoy Vineland's show then follow the signs for Ball's Falls Festival. Parking is free. There is a gate admission charged that as mentioned, goes toward maintaining conservation areas and programming on the Peninsula. While in the area, a visit to the internationally acclaimed Butterfly Conservatory located beside the Niagara Parks School of Horticulture on the Parkway between Niagara Falls and Queenston Heights is a must. Plan to take in one of the excellent plays at Shaw Festival Theatre located in Niagara-On-The-Lake, site of the first Upper Canadian Parliament and home of John Graves Simcoe. A stroll along this pretty village's tree-lined streets reveals architectural delights rarely seen north of the U.S. border. No visit to Niagara is complete without a look at the Horseshoe (Canadian) and American Falls , and a tour of the Greenhouses above the cataract, that today is the home for colourful song birds from around the world. If you are coming from a distance, plan to spend at least three days in the area. The region has accommodation and restaurants geared to all budgets and tastes.